Keeping track of your customer information, appointment history, and account overview has never been easier. 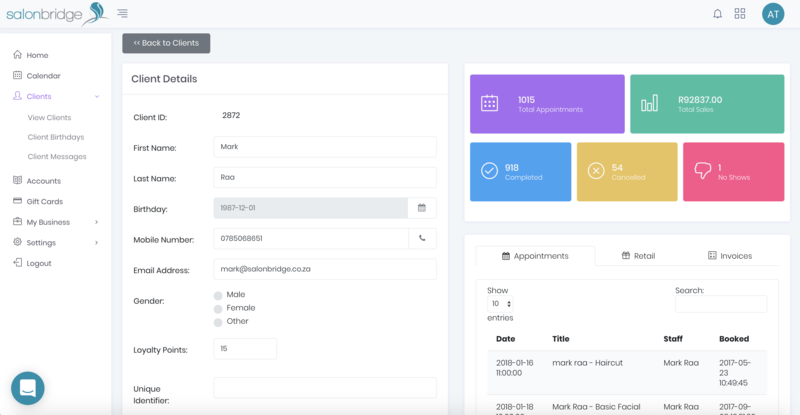 SalonBridge lets you add clients to your database manually, or automatically when making an appointment. Their personal information, contact information, communication preferences and notes can all be stored securely in your SalonBridge account. Quickly retrieve contact information, appointment history, or personal notes for any of your clients and make them feel special the next time they visit your salon or spa. Available from the SalonBridge App, and the online console, your client information is available from any device, at any location, 24/7.